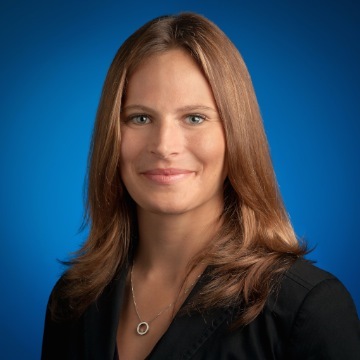 The Firebase Blog: What's new with Analytics? Here at Firebase, we know that the first step in making improvements in your app is knowing how your users are interacting with it: what parts they love, where they're having trouble, and what features are sadly underutilized. 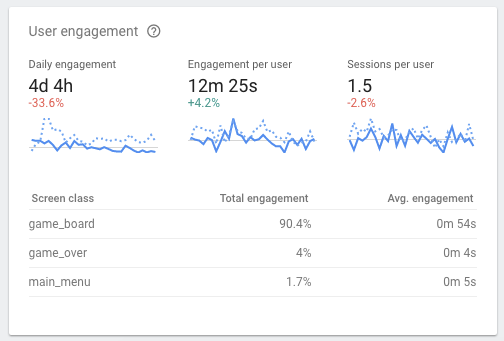 This is why we built Google Analytics for Firebase from the ground up to be a complete mobile analytics solution, with free and unlimited app analytics designed specifically for the way mobile apps are built. Now, if you were paying close attention to the last paragraph, you may have noticed that the product formerly known as Firebase Analytics is now called "Google Analytics for Firebase." Don't worry; it's the same analytics product you know and love -- and we'll talk more about the name change in a bit. Over the last year, we've made a number of improvements to Google Analytics for Firebase, including adding StreamView, which gives you an impression of how users are interacting with your app at this very moment, and DebugView, which allows you to see in precise detail what analytics events (and errors!) might be happening on a test device. This year at Google I/O, we were thrilled to announce a number of new improvements and enhancements that make using analytics even better. In case you missed those presentations (which you can also watch on YouTube), let's give you a quick summary of what's new with Google Analytics for Firebase. With Google Analytics for Firebase, you're allowed to submit up to 25 custom parameters alongside any events that you record in your app. For instance, if you were submitting a end_of_round event in a game, you could submit a user_score or premium_coins_earned parameter along with that event. By analyzing these different parameter values, you could then ensure that your game had the high score distribution or general payout rate that you were expecting. But up until now, it's been impossible to see the results of most of these custom event parameters without first exporting your data to BigQuery and doing the analysis there. Being able to view summaries of these event parameters directly in the Firebase console has been our most common feature request since analytics first launched last year. So we're very pleased to announce that we've taken our first big steps in making these reports available to you. To get started with custom event parameters in Firebase, you'll need to let Google Analytics for Firebase know what parameters you're interested in. You can do this by going to the specific event in the Firebase console and clicking the "Add event parameters" button in the interface. From there, you can specify a parameter, note whether it's a number or a string, and add units of measurement, if applicable. Once you've done that, you'll start seeing these parameter summaries directly in the console. We'll show you sums and averages for numeric values, and a list of your most popular values for strings. Like other analytics reports available in Google Analytics for Firebase, you can filter these reports by user properties or audiences to get a better sense of how different users are interacting with your app in different ways. Currently, you can specify up to 50 different event parameters for which you'd like to generate summary reports. Of course, if you want to analyze a greater number of custom event parameters, or want to do more sophisticated analysis than what's available from the Firebase console, you can export your Google Analytics data directly into BigQuery, Google's data warehouse in the cloud. Analyzing your data in BigQuery is a very powerful way of running all sorts of ad hoc queries or custom analysis on your data, and we want to encourage all our developers to try it out. To assist you on your journey, we've now added a free tier of storage in BigQuery -- 10 GB of data to be exact -- for every project using Google Analytics for Firebase. Combine this free storage tier with the 1 TB of free monthly query usage that you get from BigQuery, and you can do an awful lot of BigQuery analysis for a relatively little amount of money. And with the new analytics report templates in Data Studio, making stylish reports on custom parameters (or anything else you can measure in BigQuery) is a cinch. We've made some major enhancements in the way Firebase and AdMob communicate with each other. Much like milk and cookies1, mixing Firebase and AdMob together results in an exciting new flavor combination that complements the strengths of both products! 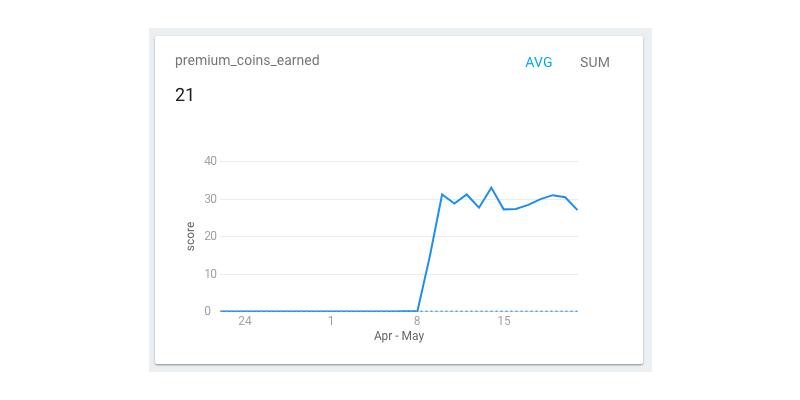 By linking your AdMob account to Firebase, your app will automatically record analytics events associated with AdMob (along with mediated ad units) just like any other analytics event. This gives Google Analytics for Firebase the ability to create reports on ad impressions, clicks, and exposure time, broken down by important characteristics such as screen, ad format or ad unit. This makes it easier than ever before to see which ads are most effective in your app, where you're earning the most ad dollars, or which ads your users spend the most time viewing. Linking your AdMob and Firebase accounts together also gives you a more complete picture of where you're making money in your app. 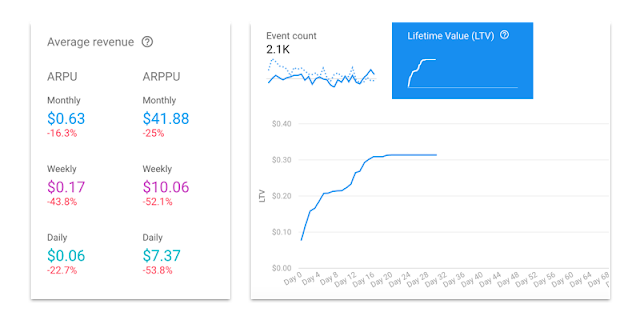 Both the APRU reports on the dashboard and the Lifetime Value metrics in the Attribution reports will now include revenue generated from AdMob advertising, as well as in-app purchases. This can help you gain a much more complete understanding of how your app is doing from a revenue standpoint, and help you more accurately gauge which growth campaigns are bringing you users who are earning you the most revenue. If, like me, you enjoy spending your free time reading the latest Firebase Release Notes, you might have noticed that a few months ago, Firebase started adding screen tracking support to the events that it was recording. This month, we're taking the first steps towards adding screen tracking reports in Google Analytics for Firebase, by showing you the top three screens your users are spending time on. You can find this information in the User Engagement section of the Firebase Dashboard. Screen tracking reporting works behind the scenes by automatically logging a screen_view event whenever a screen transition occurs. These events are then combined on the server to paint a more complete picture of the user's journey throughout your app. And just like any other event, you can view them in StreamView or DebugView, or analyze them through BigQuery. If you would like to customize these events -- for instance, you're a game developer who has multiple "screens" all within the same ViewController -- you can do so with by setting these events manually on the client. You can already use Google Analytics for Firebase for attribution tracking, which helps you learn not just which ad networks are sending you users, but which ones are sending you valuable users that you care about the most. And we're pleased to announce a new integration with DoubleClick Digital Marketing that will include attribution tracking for DoubleClick Campaign Manager and Bid Manager. Add this to the 50+ third-party advertising networks (and growing!) that we've integrated into our system, and Firebase can help you make better decisions around where to spend your advertising dollars with true cross-network attribution data. We're rebranding Firebase Analytics as Google Analytics for Firebase to make it clear that this is our recommended apps analytics solution for all mobile apps moving forward. But under the hood, you'll still be using the Firebase Analytics SDK with its event-driven model to generate all of your analytics data. If you're using the old Google Analytics Services SDK in your existing apps, don't worry; it's not going anywhere. But we encourage you to start adding the Firebase SDK in future releases. Using the Firebase SDK will give you access to the latest reports in Google Analytics for Firebase and to new functionality as it becomes available. If you're a long-time Google Analytics fan, you can use Google Tag Manager to automatically send your events data to those reports as well. If you need more help on this topic, we wrote a blog post a few months back that covers a few strategies on how to get both these analytics libraries working together in your app. Give it a read sometime! We're thrilled to be bringing you these improvements to Google Analytics for Firebase -- they should be already available in the Give it a read sometime today (check out the demo project for an example!). If you haven't yet added analytics to your product, you can find all the documentation you need here to get started. Give it a try, and let us know what you think!